Learn about the AREZ Titanium Ingredients from CJ! The evolution of NTel Pharma's popular pre workout Arez now has a new addition to the family in Arez Titanium. Arez Titanium was formulated to deliver super human focus, mind blowing pumps, and a surge of extreme powder and energy. If you've tried any other version of Arez, you know NTel doesn't hold back with formulating a great product. Comparable to the extreme Arez White, Arez Titanium really packs a punch in the energy and focus department. Extreme and long lasting energy without the jitters or crash will have you crushing your workouts and lifting more weight. The laser focus will have you zoned in on each and every rep to ensure you're connecting with the muscle on each and every rep to build more muscle. Arez Titanium will increase blood flow and force blood into the muscle causing it to expand and grow. Those massive pumps will lead to new muscle on those grinder sets shuttling blood into the muscles. This is not a pre workout for beginners and do not take within hours of going to bed. Beta Alanine – Improved performance by decreasing lactic acid in the muscle. L-Citrulline – Boosts nitric oxide levels which promotes more blood flow for increased pumps. Juglans Regia Extract (DMHA) - Boost in energy, oxygen uptake, and sharpens focus and alertness while reducing fatigue. Eria Jarensis Extract – PEA alkaloids that have mood elevating benefits and increase in mental focus. Synephrine HCI – Intense stimulant with fat loss properties. Rauwolfla vomitoria – A form of yohimbine. Stimulant that aids in fat loss of those stubborn body fat stores. Choline Bitartrate – Improves cognitive function, alertness, and mental energy. AREZ Titanium - Comparable to AREZ White from an energy standpoint. Higher doses of Beta Alanine and Citrulline. Uses a different form of DMHA for energy. 2-Amino-5-methylheptane (Juglans Regia) vs 2-Amino-6-methylheptane in AREZ White. 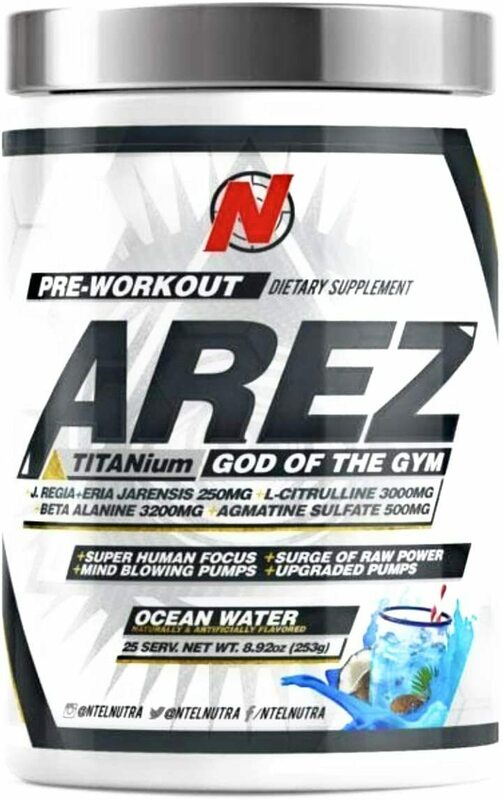 AREZ God of the Gym - Powerful pre workout that does not utilize DMHA as a stimulant. Higher amount of Citrulline than both AREZ White and Titanium. Great performance pre workout. AREZ White - Original AREZ formula utilizing DMHA as 2-amino-6-methylheptane. Crazy potent from a stimulant standpoint. Will be discontinued.